Location: Richmond Twp, Tioga County On Rte 15 Business, across from Penelec Bldg. NOTE: Cared for by Richmond Twp. Lownsberry Sally C. Jun.5.1823 Mar.15.1905 On stone w/Frank D.
When Hurricane Agnes and the resulting flood hit this area  , it demolished a small cemetery along Rt. 15 at Canoe Camp. After the waters had subsided all the grave stones that could be found were piled along the river band and there they remained for almost a year while the cemetery was covered with trash and the area residents bemoaned the fact that no one was putting it back to rights. Theodore Besanceney and others from the Canoe Camp area began trying to find out who had been buried there, who owned the cemetery and what its name was. The have been discouragingly unsuccessful. No one remembers the name. There was no plot of graves. 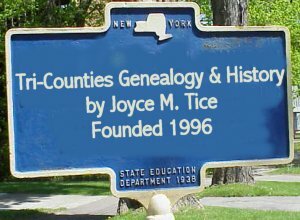 Even The DAR which has plotted many cemeteries in the area had no information and no budding genealogist has come forward with information. No one knows who owns it. Mrs. Joseph Chance of Sebring had the most information to give. They have discovered that it was originally on the old Lonsberry Farm whose farm house once stood near the Edwin Trask home. Frank Lownsbery, Howard Hager, Fay Killgore, Stuart Nays, Ed Trask, and the Richmond Township Supervisors (John McGraw) have all help in the restoration. There is no money to reset the stones, so those that had no bases are being placed flat and the area seeded so that it can be kept mowed and looking nice. Bentley, Lonsberry, Mosecar, Cass and Stratton are the family names of most of those buried there. The oldest grave is a boy age ten, buried in 1823. The marker is a field stone carved by hand, apparently with a chisel. “This little bloom nipped in the bud,” is part of the inscription. The thanks of the community goes to those who have worked to restore the cemetery with no name. If anyone has information about this cemetery and those buried there, please contact Theodore R. Besanceny, RD 3, Mansfield. Mrs. Tamazon Gillett, aged 94, died at her home at Canoecamp on March 3d. She was born at Smithfield, Bradford County, Nov. 11, 1811, and came to this county in 1823. Her eight children survive her. They are: Mrs. M. A. Cass, of Mansfield; Mrs. John Walker, of Somers Lane; Mrs. Letson Lownsbery, of Elmira; Mrs. Daniel Lownsbery, of Jackson Summit; Aaron Gillett and Andrew Gillett, of Canoecamp; Frank Gillett and Clinton Gillett, of Mansfield. Isaac Lownsberry [SRGP 39958] d. Canoe Camp Sep 18th, b. Schoharie, Ny., Feb 9th 1811, came here about 1818. 1st m. Laura A. Gillett, dau. of Aaron and Ziba. They had: George W. of Col. (dead); Sarah Morehouse, state of Washington; Lucy H. Kephart of Kansas (dead); Julia A. Morehouse of Minnesota; John of Canoe Camp. 2nd wife Mrs. Gillah J. Edsall of Southport, Ny., who d. 1852. Last of 11 children himself - they were: John of Oregon; Anna (Peter) Zimmer, Schoharie Co., Ny. ; Lydia (Daniel) Holden, Mansfield; Ruth (Peter) Whittaker, Canoe Camp; Mary (Bethnel) Bentley, Mill Creek; Susan (Seymour) Stratton,Canoe Camp; Letson L., Canoe Camp; Wright L., Illinois; Ira L. of Canoe Camp; Eneas L.